The Tomahawk Steak at Prime Steakhouse. Niagara Falls is home to a number of wonderful restaurants that offer great food, first-class service, and incredible atmospheres. 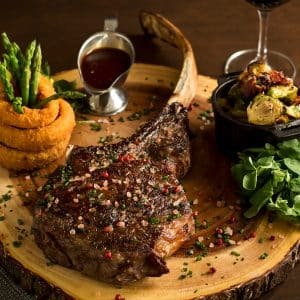 And Prime Steakhouse inside the Crowne Plaza Fallsview is quickly making a name for itself as one of the city’s standout dining experiences. What makes Prime Steakhouse a favourite among Niagara food-lovers? Let’s explore. But perhaps the menu’s crowning glory is the newly-introduced 40 oz. Tomahawk Steak, which is a Canadian Prime signature long-bone rib steak. The restaurant encourages guests to call ahead for this specialty cut to confirm availability and will cook it exactly to your liking. It’s a mouth-watering menu item that’s a must-try for steak lovers. Tesla: Named for the man who first harnessed the amazing power of Niagara Falls, this cocktail is a blend of whiskey, Calvados, lemon, and bitters. Dillon’s Sazerac: This cocktail is hand-crafted using local ingredients from the Niagara Region including Dillon’s whiskey, Dillon’s orange bitters, and Dillon’s absinthe. Niagara: This cocktail is as incredible as the view and features a combination of vodka, Cointreau, lemon, and a touch of ginger beer. A great atmosphere makes for a great dining experience, and at Prime Steakhouse, the atmosphere can’t be beat. The restaurant’s dining room is designed to provide diners with spectacular views of Niagara Falls from every single seat. Visit Prime Steakhouse today and find out for yourself what makes this Niagara Falls restaurant so extraordinary.